Here on this page we list some of the tips of countries that we do not yet feature, perhaps it is a great restaurant in Paris or the best hotel in London. As we do not yet have pages for these individual countries we felt that we should still share the tips with you and so have accumulated them all on to this one page. If you have any additions then please do let us know. Perhaps you had dinner in an amazing restaurant in New Zealand, or stayed at an amazing yet cheap little hotel in Colombia, whatever your tip, if you would recommend it to your closest friends we would like to hear it. We will be adding to this section all the time so do keep checking back. To have you tip featured just send us an e-mail. Paris, France - Hotel De Vigny (by ATT) is a hotel in Paris in a completely different league. It is very much a small boutique hotel. As a member of the highly respected Relais & Chateaux it has to comply with what they call the 4C's to put it simply this hotel has to be very good, and believe us very good it is. It is a very personalised hotel with a lot of character. It can be found on La rue de Vigny just of the Champs Elysees. The rooms are well decorated and even comprise of a Bang & Olufson television and stereo player, how many hotels can claim that ! Paris, France - Chicago Pizza Pie (by ATT) just of the Champs Elysees is a great place for some American food in an atmosphere that is both lively and very friendly , a great bar is also at hand and it is an excellent meeting place, and a very handy place to move on from for the rest of the evening. It will come as a surprise that a lot of birthday goers come here for the fun of the place. Suddenly the lights will go dark, the music will be turned up, and all the waitresses will go around in conga singing..... This is also happens when there is no birthdays but we will let you discover what they sing and dance along to. We do sound one word of caution though there are some women there (well it only happened to us once) who will entice you to go somewhere else with you, and then well we are not sure as it never got that far. But we advise that when picking up a lady from here you use your common sense. 99% of the women are fine, perhaps out of the hundreds of times that we have enjoyed this bar we fell on a bit of bad luck. Normally though your inner alarm bells will be ringing if it sense something may be wrong. It is a great place enjoy it ! Paris, France - Internet Services (by ATT) if you are in Paris and need to connect to the internet and you must use your own computer, and your hotel does not fit the bill, in terms of the telephone network, then you will be faced with tremendous difficulties. Most Cyber Cafe's work on a network basis which means that you would need to configure your system appropriately, quite a headache. France Telecom cannot help. The only place that we could find where you can connect with your own computer is in the 15 arrondissement, between the Metro La Motte Piquet Grenelle and Dupleix. Just around the corner from the Holiday Inn hotel is a small shop called Internet Station, you cannot miss it as Internet is clearly marked above the door. For just one franc a minute you can do all the work you need. The telephone number is 01 - 45 77 58 58 and are open from Monday to Friday from 10:30 - 19:00. Address : 8, rue Violet, Paris. Paris, France - Changing Money (by ATT) if you have not been to Paris you may be surprised to find the charges that the bureau de change charge. If you are changing non European money you should not have to pay any commission but if you are changing European money, then you will have to pay. The famous Cheque Point service on the Champs Elysees wanted a whopping 9.8% and the girl behind the counter actually laughed when I asked if that were correct. She kindly explained that was why her company was so rich ! Needless to say we did not change our money there. You can use other services, such as Thomas Cook or even the Tourism Office on the Champs, which charge around 2.5% - Make sure that you ask what the commission is before changing. 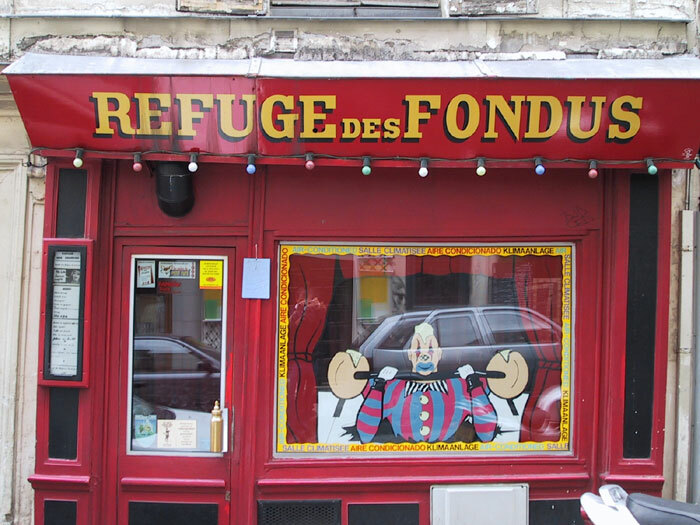 Paris France - Refuge des Fondues - (by ATT) a great little restaurant that serves fondues. The walls are covered in graffiti, the wine is served in Baby bottles and there are only two long tables with you sitting elbow to elbow with your neighbor. It is very popular and we do advise booking a table, or at least getting there early. If you are female we do not advise you to wear a short skirt to this restaurant as you will be asked to step over the table to get to the other side ! The address is 17 rue des Trois Freres, which is not far from the bottom of Sacre Coeur. Closest Metro is Pigalle. Paris, France - The Louvre - (by ATT) if you are planning to visit this amazing monument to art the do try to get there early. The queues especially the weekends can be frightening. The museum will generally open at 09:30. Paris, France - An Oddity ! - (by ATT) it is actually illegal in France to have an ashtray on the bar. Use the floor ! Cannes, France - Noga Hilton Cannes (by ATT) is our favourite main stream and main location property in Cannes. The lobby may be a deceiving and quite outrageous mix of colour created perhaps by a drug induced designer but the rooms are simply amazing. The hotel even has a video machine where you can rent all varieties of films directly from the machine. In a great location it is very difficult to beat this hotel. Berlin, Germany - Steglitz Hotel (by ATT) the only reason that we mention this hotel is because of its' beds. This hotel has waterbeds, but not in all the rooms. This means that if it is very busy then you may find yourself being sea sick in the middle of the night as no normal rooms were available ! Some people like waterbeds, so whichever if you want one request one if you don't specify it ! Tokyo, Japan - Hotel Seiyu in Ginza (by ATT) This is an incredible hotel and our favourite in Tokyo. All the stars have stayed here including Arnold Shwarzenegger, Glen Close, the American Athletics team, Oliver Stone, Elizabeth Taylor and many many more. The beauty with this property is that it is pure class and does not scream out at you. All the decorations are softly done, and with only 80 rooms the hotel is never going to be over run with guests. The personal service, and excellent quality of rooms does not come cheap however. Rooms go for an average of US$ 600. Who said the best is cheap ?! Osaka, Japan - Hotel Hankyu International (by ATT) If you are in need of luxury then this hotel will fill all your requirements, one of the best hotels in Osaka with excellent views and spacious rooms. Singapore - Brix (by ATT) One of the best bars in Singapore, located at the Grand Hyatt, if you were wondering where the infamous Brannigans has disappeared to then this is it. They feature excellent bands and the decoration of the bar is very relaxing. A different crowd from the old Brannigans yet still as busy. In fact at weekends you want to get there reasonably early otherwise you will nee to queue - be warned ! We know have many more Singapore tips and reviews, please use the links to the left. Singapore - Chijmes (by ATT) is an excellent place to wind down after a hard days work or play and is a must visit for anyone in Singapore. It is very popular with the locals and also with tourists. It is located next to Raffles City shopping arcade and opposite the Carlton Hotel, and close to Raffles Hotel. It has a wonderfully relaxed ambience to it and there are numerous bars, restaurants and pubs available for you to discover. Singapore - Gatsby's (by ATT) This restaurant can be found in the downstairs area of Chijmes (see above), next to The Jump. It serves excellent International style food in the cool and relaxing atmosphere air conditioned restaurant or out on the terraces below the skies. They have excellent wine and their bread is sumptuous, just make sure you leave enough room for the rest of their delicacies. Singapore - The Jump (by ATT) formerly known as The China Jump, is a chain of restaurant/bars, with one in Hong Kong and another in Kuala Lumpur. The food they serve here both indoors and also on the terrace outside is very fulfilling and is not for those on a small appetite. The service is generally friendly. As always you can not smoke inside a restaurant in Singapore. This changes at 10:30 when the kitchens close and the real partying begins, They remove a lot of the tables and chairs to create room for a dance floor, and the music begins. Queues can get very long here especially at the weekend so try to get there a little earlier. Singapore - Airport (by ATT) You may or may not know that you cannot legally take cigarettes into Singapore. This also means that you cannot buy any from Duty Free on the way into Singapore, so don't let your Singaporean friends try and get you to buy them some. If you are caught chances are you will be fined. You can buy Perfumes and Alcohol at good rates before you go through customs so it may be wiser to leave your purchases until you get there. Strangely enough even though Singapore is strict with cigarettes etc when you are leaving they are for sale in Duty Free at some of the Cheapest prices in the world. For example 400 Dunhill Red International will cost you roughly Sin$29 which is the cheapest we have ever found them anywhere. Read our full review of Singapore Airport here. We now have an entire section of our website devoted to Singapore, with many more tips and information. Seoul, Korea - JJ's (by ATT) As always the Grand Hyatt can always be relied upon to have a great bar. Korea is no exception. JJ's is split into two sections one more disco relate and the other a cosy (sometimes a little too cosy) bar where live music will make you party the night away. Seoul, Korea - Grand Hyatt (by ATT) Quite simply the best hotel in Seoul. They offer the best views, they are even so creative as to turn their swimming pool (the outdoor one) into an ice skating rink in winter time. They have great restaurants and as you have read above the best bar in Seoul.